Ever wondered how painters got those straight lines? 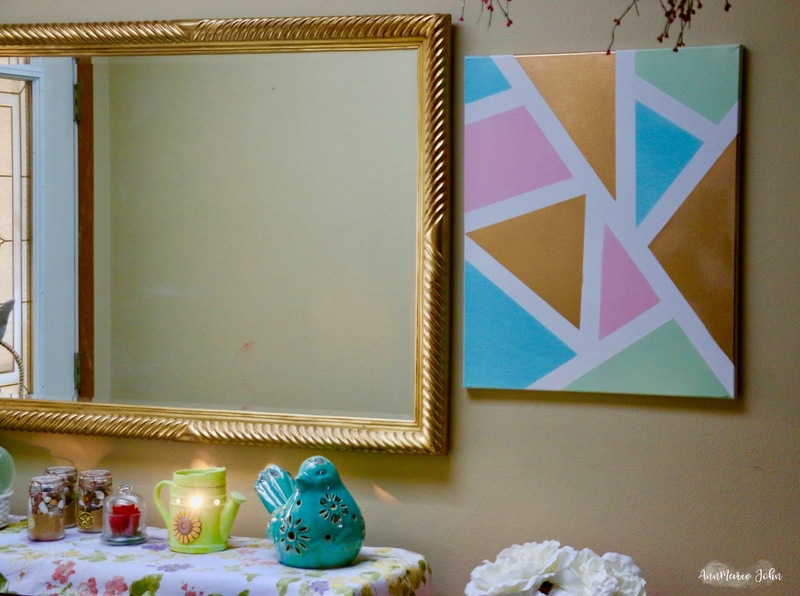 Wonder no more, because we're going to show you how you can too, with FrogTape, as well as spruce up a wall in your home with your very own custom designed geometric canvas art. One thing I love doing is decorating my home. I have quite a few paintings in every room in my home. However, none of those paintings were done by me. They were all purchased at home decor stores. One of my favorites was purchased for my birthday last year for my 40th, and I spent a few hundred dollars getting it. 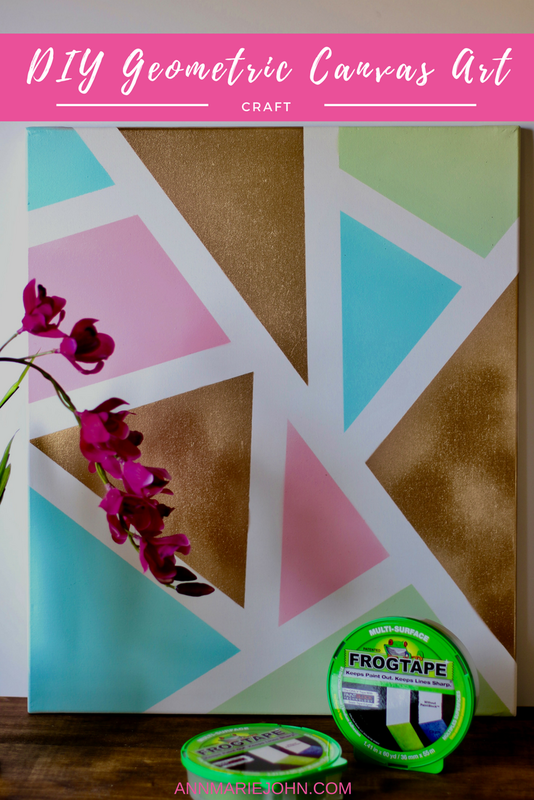 Decorating your home, however doesn't have to cost you hundreds of dollars, and for those who think that they can't have a beautifully decorated home, with one of a kind paintings, I'm going to show you how you can with the help of FrogTape. While I love my home, my entry way left a lot to be desired. Sure, I have an entryway table that I decorate for the seasons, I have a wall mirror that I always have to glance at when leaving the house, but besides that, there was nothing else on the walls. I have always wanted wall art, but because of the changing seasons, I needed to find something that would fit in, or maybe even do my own for the changing seasons. I decided to do my own. I took a look at the 2017 FrogTape® Design Trends and the Haute Homemade really stood out to me. Instead of purchasing another piece for my wall, how about making something instead? I knew exactly what I had to do and to be honest, it worked out to be even less expensive that me purchasing it. With the money I saved, I can do a few more for the Fall and Christmas season that's coming up. Step 1: Start by getting your canvas and FrogTape. Use your FrogTape to get the shapes you desire. There is no perfect way to do this, but remember this is your masterpiece. Step 2: Once you have your shapes the way you want, go ahead and start painting in the open spaces. Don't worry about it getting on the tape, it will be ok. You're going to get those sharp lines that I was talking about, because FrogTape® brand painter’s tapes are treated with patented PaintBlock® Technology, a super-absorbent polymer that reacts with the water in latex paint and instantly gels to form a micro-barrier that seals the edges of the tape, preventing paint bleed and the need for touch-ups. The results are crisp, clean paint lines the first time. Step 3: Once you've painted in between the lines, go ahead and pull that tape off. What you'll be left with will be nice clean lines and a geometric design that you designed. It will be your work of art. Just look at how clean my lines are!! I would never have been able to do this if I didn't have FrogTape! 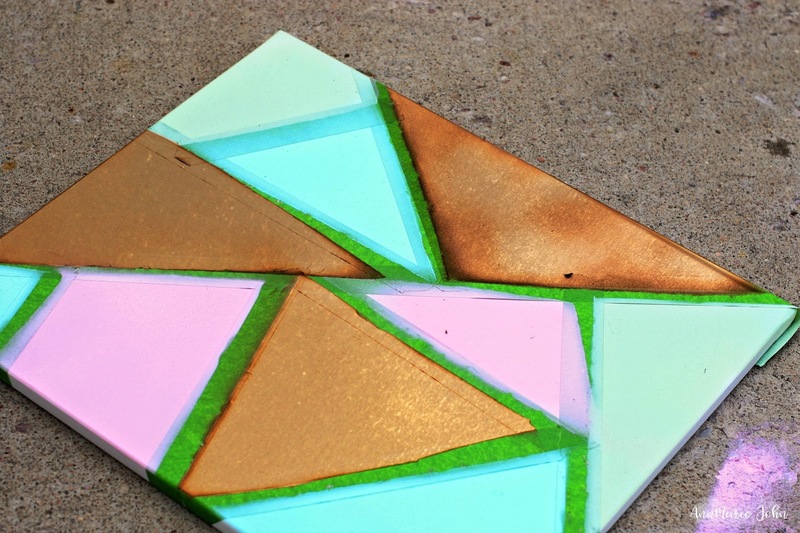 Now you too can make your own geometric one of a kind art, in the color of your choosing to complement your decor. You no longer have to spend hundreds of dollars and these will all be originally yours. So grab some canvas, some paint and don't forget your FrogTape. This canvas art looks amazing!! I'm not artistic in the slightest but my father loves to paint and has canvases of his work all over his house. I think he'd get some good use from this tape!! This came out so great. I will have to pick up some FrogTape and give this a try. I am not too artistic, but this looks like something I could do. My oldest did this in school this past year! It's an incredibly easy way to make a cool piece of art. That is so cool! I have never thought of doing my own art before, but it looks really easy. I LOVE the results. I have to try this. That is so pretty! I've actually been looking for a geometric painting for a space in my home. Now I can just make my own! That is such a simple craft to do yet it comes out looking so elegant and funky. I adore it. Looks fabulous in that space too! I love this idea! It is something that my kiddo when I can do together and have a lot of fun. It'll look so classy in our house. This is amazing. It is so creative and a great way to teach shaped to the kids! This canvas art is so pretty! I love how easy it is to make, i never would have thought about doing this! I would love to make a few of these for my living room. What a great DIY art project! I don't actually have an entry way, but this would be fun to put anywhere. That is a great idea for how to use that tape! I always wondered how the colors didn't bleed onto the white. I know, I have wondered that too. Guess I need to pick myself up some Frog Tape. This looks so beautiful! Must say it is very creative and nice. My sis loves art work and I am going to share this with her and I am sure she would love to try this out. That is a great creation and the lines are so sharp. I have to get that FrogTape and make a piece of art for my home. my kids would love to help with this. Me too. Frog tape certainly makes this easy. I love DIYs like this one. Years ago when my oldest daughter redid her room, we did this. She loved it! It was art that she had made herself. However, we didn't use spray paint. I love that idea! It totally makes sense. Why spend so much on decor when you can make your own, and it's fun too! I think this is an amazing idea and I love the colors that you picked as well. That's a lot of fun! I love doing work like this. Thanks for showing us your masterpiece! I love the gold paint you used. This idea of DIY canvas art is brilliant! I know that my teen daughter would have a blast doing something like this so I emailed her the link. What an easy way to spruce up the home, I know our walls are white as white can be, we need to use this to add some color to our household. Scarlet would love this. She likes to sit and make geometric art by hand with her great aunt every July at Cape Cod. We're going there this week and I can't wait to see. I'm going to suggest this project! What an easy and cheap way to decorate your house! Plus, you get to choose the colors! 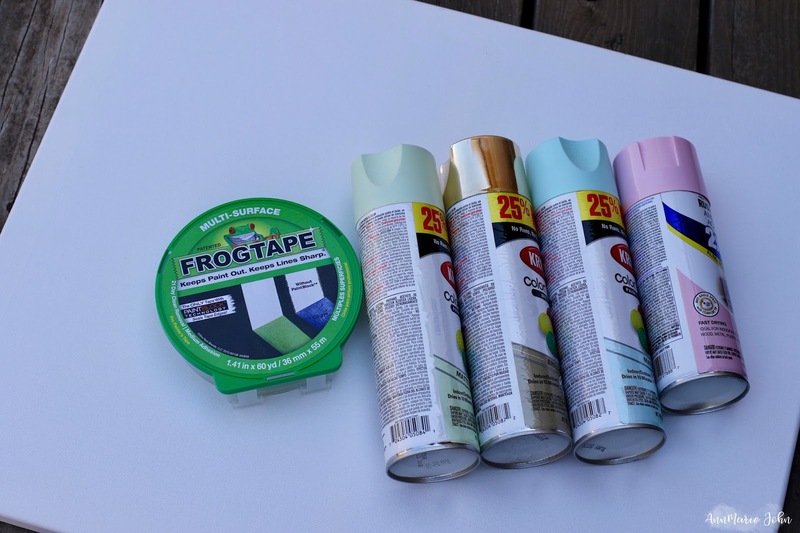 I just recently used Frog Tape and it was amazing! That turned out so cute and looks so sophisticated! I love the little sparkle that the copper gives to the piece! I like that...and what a great job you did. I"ve never tried this, but my walls are bare in my study and this would be the perfect place to hang a pic like this. Gosh this looks amazing! What a creative way to use Frogtape! I think it would be so fun to make some art this way. I absolutely love this! How easy and it makes such a great impact! That looks like a fun idea. I bet my daughter would have fun with this project. This is such a cool project idea. I am going to have to do something like this for my garden. There is a brick wall and I have been wanting to make some art for it. I definitely need FrogTape because I can't keep a straight line for anything. This looks so easy that I'm tempted to give it a try. I tend to be extremely bad at creating art, but this looks doable! For holiday gifts my boys and I do a similar craft but instead of geometric shapes, they paint over letters for their Nana, dad, etc. I love how your gorgeous canvas came out! I might try to make my own decor at my room! This one is look easy and neat, I will definitely try it. this is absolutely adorable! I love the colors you used and it looks so professional. Wow. That sure turned out pretty! I wish I could do more design crafts like that. I really do have to free up some time for myself. My daughter used this when she painted her closet, it turned out beautiful! I love that art piece you created. This is really cool!! I would love to try this! Such an adorable piece! This is such a cute art project. I would love to make one of these for my family room. Now that is fun! I would totally love to try this out and spruce up my own with my own canvas art. What an awesome use of tape! I would have never thought in a million years to use it on canvas! I love how it turned out and I just may have to reproduce it! I love green frog tape for my projects too. Truly has become one of my favorite DIY project supplies. My colors for my house have been changing slightly. I have been adding more gold in, so your canvas is perfect for me. I love that you could adjust the colors to anything that suits your style. So cute! This looks cute and fun to do! A fun simple project. I think even my kids would like to do something like this too. That is such a beautiful piece! I love the creativity and I can see my daughter making one to match her room colors! Wow! This turned out absolutely amazing! I love the touches of gold, the best part for sure! I have always wanted to make one of these! I need to sit down and actually make one. They're so cute and would be a lot of fun! Especially for my office! A great DIY project and a way for me to bring out my creativity. Love when I learn new things. This is so cool! I like how creative and easy this is. This sounds really fun to try! Wow, that is super cool! I love the look of that! Wow, I loveeee your choice of colors! This looks so easy, I can't wait to try it! Those lines are perfectly crisp. 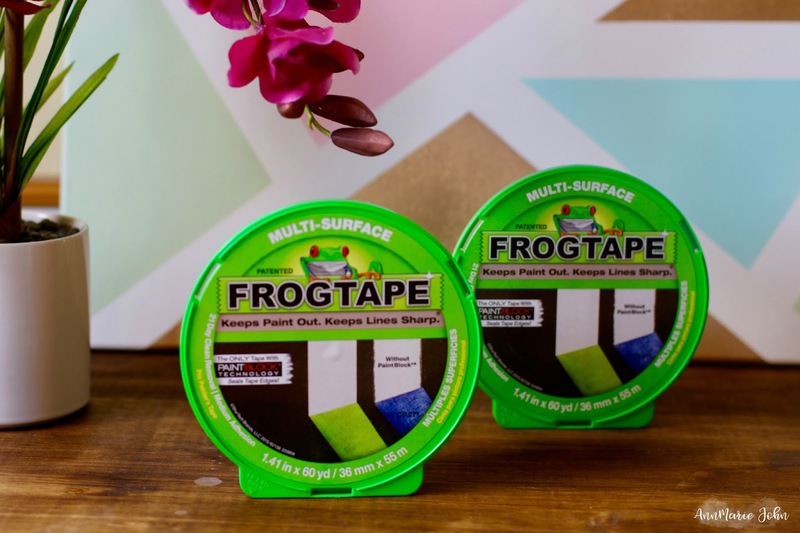 Frog tape is so awesome and I've used it for quite a few big projects in our home too. 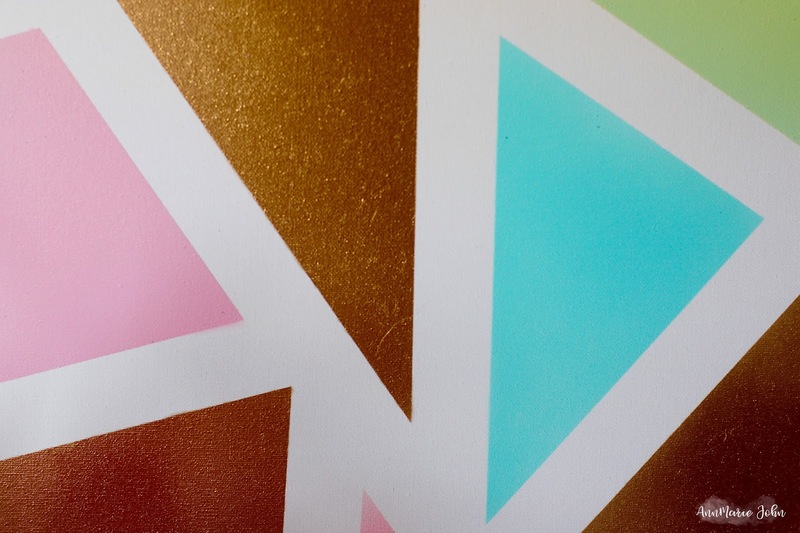 Your paint colors are so pretty, I love the metallic! That's such a fun idea! I want to actually try this with my kids. They would love to do it. I so love this idea. It looks like it should be hanging in a museum. I am going to have to try this with my girls. I definitely want to make this canvas painting with my boys! I saw it on facebook once and thought it would be so much fun for my boys to make their own artwork! Hey you! What a cool craft idea! I never thought about using tape as part of my design! 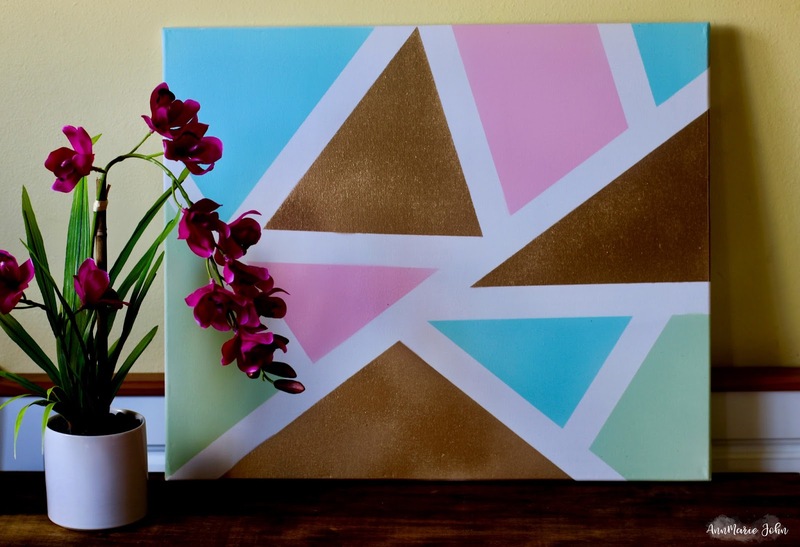 I liked this DIY geometric canvas art. Using frog Tape to decorate the canvas is an awesome idea. Great post.